Recorded as from Piscataquis County, Maine. Acquired in the 1920s by (Robert Gerry Hall, Dover-Foxcroft, Maine), by whom sold in 1948 to Edgar William and Bernice Chrysler Garbisch; gift to NGA, 1955. American Primitive Paintings from the Collection of Edgar William and Bernice Chrysler Garbisch, Part I, National Gallery of Art, Washingotn, 1954, no. 106. The American Primitive Paintings Exhibit, organized by the Triton Museum of Art, Santa Clara, California, for de Saisset Art Gallery, University of Santa Clara, 1968. The American Flag in the Art of Our Country, Allentown Art Museum, Pennsylvania, 1976, no. 25, color repro. Scenes of Folk Art, Wurttembergischer Kunstverein, Stuttgart, 1981, no cat. A Little Bestiary: Naive Paintings from the Collection of Edgar William and Bernice Chrysler Garbisch, Montclair Art Museum, New Jersey, 1988, no cat. Extended loan for use by Ambassador Gerald S. McGowan, U.S. Embassy residence, Lisbon, Portugal, 1999-2001 (unnumbered brochure, repro.). American Paintings and Sculpture: An Illustrated Catalogue. National Gallery of Art, Washington, 1970: 126, repro. American Paintings: An Illustrated Catalogue. National Gallery of Art, Washington, 1992: 386, repro. Chotner, Deborah, with contributions by Julie Aronson, Sarah D. Cash, and Laurie Weitzenkorn. 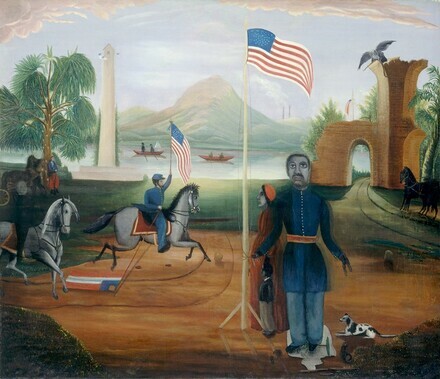 American Naive Paintings. The Collections of the National Gallery of Art Systematic Catalogue. Washington, D.C., 1992: 401-403, color repro. 402.